Jami Taback is an artist who produces her artwork through a unique process of creative collaboration with inner city youths. Creating a dynamic and flexible model for teaching art to children, she visits alternative, public and private schools using art to establish meaningful connections with children. The activity of making art with her serves to gain their interest, involvement and trust. Taback is able to draw on the skills born out of her private art history lecturing service, Talk Art, Inc. which she founded and operated for over 30 years. And perhaps more importantly, she also uses her creative talent and sensitivity as a master printmaker and painter to forge these connections. To date, she has taught and interacted with over 200 children in the last 4 years. Taback’s program is based on an intensive mentoring relationship with youth, particularly those with behavioral problems and special education needs. Through learning about the art of Printmaking and its history rooted in ancient civilization as a tool for communication, students immerse themselves for a school term-year involvement in the arts and education. 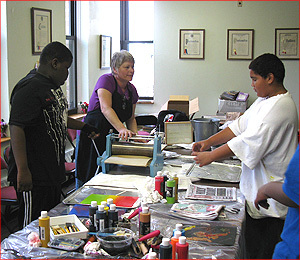 A printmaking studio with a portable table press is set up at the school for the duration of the project where the youth visit for several hours each week to learn about and produce their own work which is then incorporated into a museum quality mural, a public installation at their school. Field trips to museums further enhance the art experience. Generous donations and discounts on art supplies cover a portion of the expenses. The children, who often come from schools that have drastically, if not altogether cut, their art programs, enjoy profound benefits from her services. Sometimes, it’s just to engage the kids in something creative, to think about things differently, to meet an artist, but sometimes it sparks an interest, and they find out that they are an artist too.